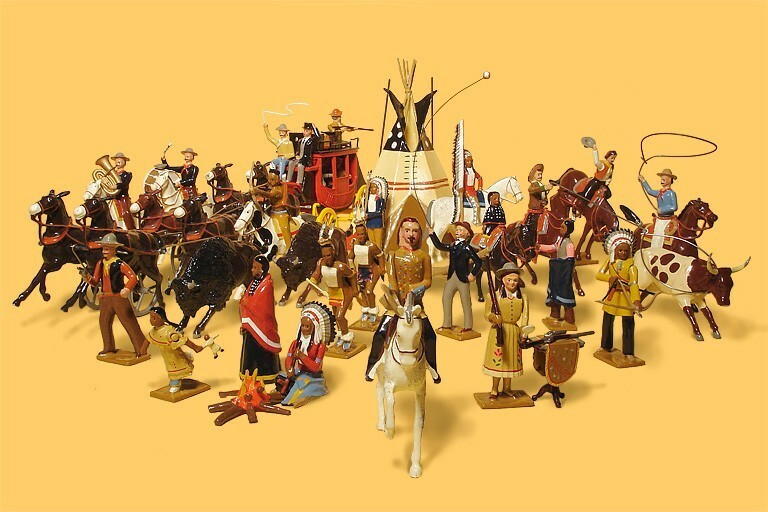 Long time German comrade-in-small-arms Gisbert Freber has helped put together a fantastic display for the Stadtmuseum of Mainz representing Buffalo Bill's 1891 visit to the city of Mainz. I am pleased to say that his own Wm. Hocker Set #230 is the centerpiece of the display. He has sent along a brochure for the exhibit and a link to the TV announcement. 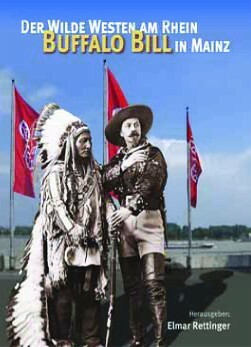 More articles about Buffalo Bill in Mainz are here and here and here. I don't speak German but the gist seems complimentary. I couldn't be more pleased! When it comes to the production and distribution of mass culture, no country in modern times has come close to rivaling the success of America. From blue jeans in central Europe to Elvis Presley's face on a Republic of Chad postage stamp, the reach of American mass culture extends into every corner of the globe. Most believe this is a twentieth-century phenomenon, but here Robert W. Rydell and Rob Kroes prove that its roots are far deeper. 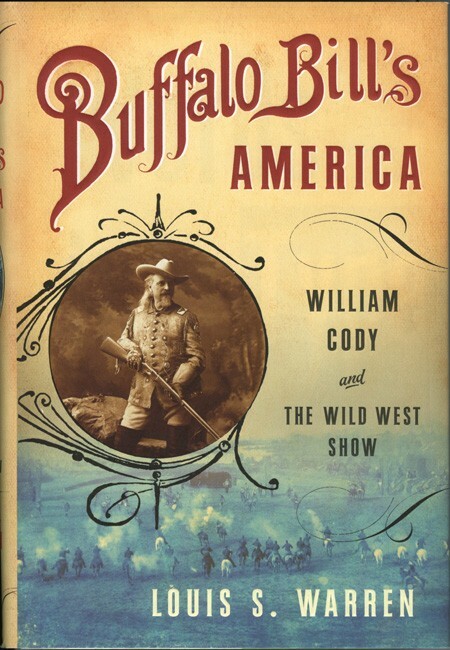 Buffalo Bill in Bologna reveals that the process of globalizing American mass culture began as early as the mid-nineteenth century. In fact, by the end of World War I, the United States already boasted an advanced network of culture industries that served to promote American values. Rydell and Kroes narrate how the circuses, amusement parks, vaudeville, mail-order catalogs, dime novels, and movies developed after the Civil War�tools central to hastening the reconstruction of the country�actually doubled as agents of American cultural diplomacy abroad. As symbols of America's version of the "good life," cultural products became a primary means for people around the world, especially in Europe, to reimagine both America and themselves in the context of America's growing global sphere of influence. 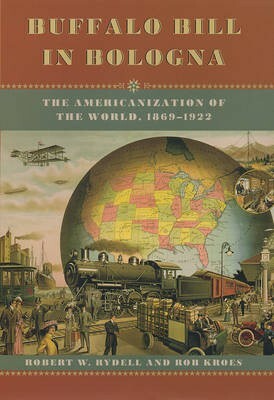 Paying special attention to the role of the world's fairs, the exporting of Buffalo Bill's Wild West show to Europe, the release of The Birth of a Nation, and Woodrow Wilson's creation of the Committee on Public Information, Rydell and Kroes offer an absorbing tour through America's cultural expansion at the turn of the century. 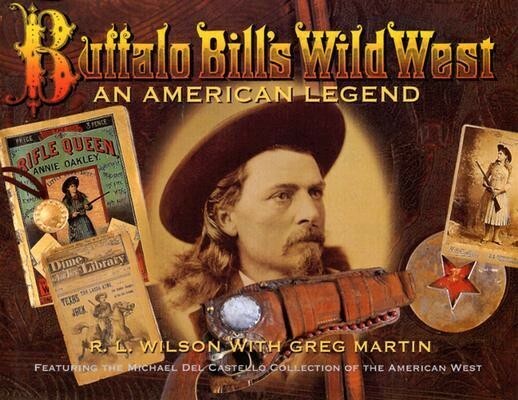 Buffalo Bill in Bologna is thus a tour de force that recasts what has been popularly understood about this period of American and global history. 1893., Oil on canvas, laid down on wood, 22 x 30 inches. Signed and dated lower left: "Alfred Agoust / 1893." 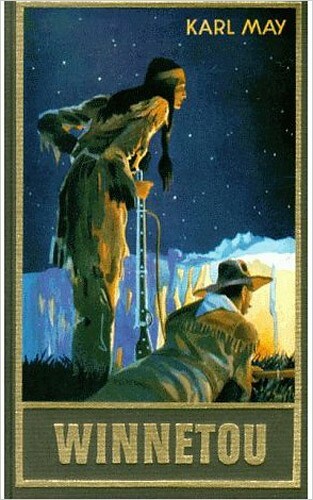 Titled: "Buffalo Bill" on Kennedy Gallery labels. Provenance: Kennedy Galleries; Collection of Edward Eberstadt & Sons. Superb displayable condition. Handsomely presented in a period-style gilt American exhibition frame. 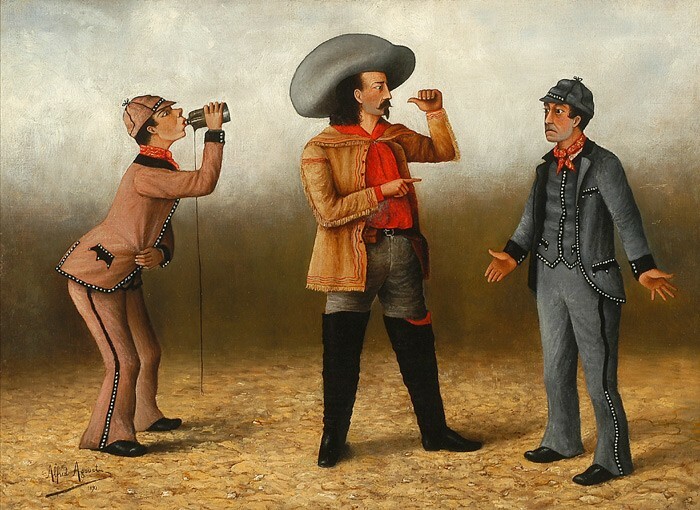 This entertaining painting depicts a version of the comedy pantomime routine called "The Frenchman's Bottle Gag" performed in England by Buffalo Bill Cody's Wild West Show. The painting shows a bewildered Buffalo Bill ready to come to blows with two Cockney characters stealing drinks from his flask. A prominent historian of performance tells us: "The gag, made famous in Paris by the Scanlon Brothers and their collaborator, the Agoust Family Jugglers, in the long playing three- stage acrobatics, magic, and pantomime spectacular, Le Voyage en Suisse, usually involves two clowns, a ridiculously dressed Frenchman, and his bottle. The clowns steal his bottle and surreptitiously sneak sips back-and-forth, as the bewildered Frenchman desperately attempts to figure out who's got his bottle. This image is of costers or pearlies, East End London cockneys, victimizing the Buffalo Bill character - the old Hanlon & Agoust drinking routine re- costumed for the Wild West show's British audience." Buffalo Bill Cody's Wild West Show made two extensive tours of England and Europe prior to the date of this painting: 1887-88, arriving for Queen Victoria's Golden Jubilee; and 1889-93, playing the great theaters and fairgrounds. The 1893 tour was at the height of the show's fame. The 1893 show program states: "Since the visit of Buffalo Bill's Wild West to England and its remarkable engagement in London, at West Brompton, in 1887, a history and tour have been made, such as no organization of its magnitude and requirements ever accomplished." Henri Agoust, the Hanlon's long-time collaborator (the parties later fell out and sued each other in a bitter legal dispute), had a son named Alfred, a member of the Agoust Family Jugglers. According to a census of traveling show people, he would have been in his early twenties in 1893. His biography is otherwise unknown. It seems likely that the juggling Alfred Agoust was also the well-trained, talented artist responsible for this magnificent show business painting, its attention to costume, props, and comic gesture demonstrating the specialized knowledge of the insider. Almost all images of the Wild West Show are found in the great lithographic posters and photographs produced by the William F. Cody publicity machine. Period oil paintings of the Buffalo Bill act are very rare indeed. This wonderful image, showing a comic routine Buffalo Bill evidently adopted from European circus acts, is a unique contribution to the iconography of the Wild West Show. John A. McKinven, THE HANLON BROTHERS. THEIR AMAZING ACROBATICS, PANTOMIMES AND STAGE SPECTACLES (Glenwood, Il. : David Meyer Magic Books, 1998), passim. BUFFALO BILL'S WILD WEST AND CONGRESS OF ROUGH RIDERS OF THE WORLD (Chicago: Blakely Printing Company,. Germans have been fascinated with the Wild West since the 19th Century. The popularity of the subject was enhanced by the writings of German novelist Karl May (1842-1912) whose Winnetou (1893) became a bestseller in Germany and around the world. 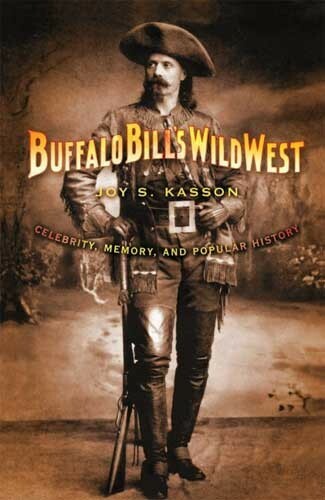 I wonder if May attended the Mainz Buffalo Bill show?